Well the tailgating woman, who was obviously in a big hurry, wasn’t very happy. 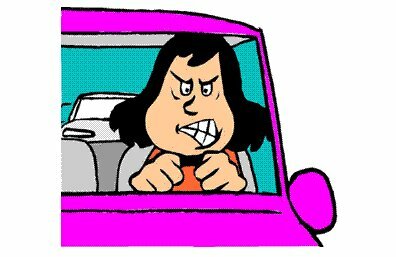 She began honking her horn, screaming obscenities, and making obscene gestures (you can use your imagination to fill in the details there!). All of a sudden, she heard a tap on her car window. It was a policeman. He told her to get out of the car and to put her hands up. Then he took her to the local police station, where she was searched, fingerprinted, photographed, and put into a holding cell. Two hours later, the policeman came to get her. He took her to the booking desk and gave her back her personal effects. Then he said, “I’m very sorry for the inconvenience, Mrs. Jones. But let me explain what happened. I pulled up behind your car while you were blowing your horn, cursing and swearing uncontrollably, and making some not-so-nice gestures with your hands toward the man in the car in front of you. At the same time, I noticed the ‘Choose Life’ license plate holder on your vehicle, as well as the ‘What Would Jesus Do?’ bumper sticker, and the Christian fish emblem on the trunk. That’s an old story, but it illustrates a timeless truth. It shows that there is a close connection between COMMANDMENTS and CONSEQUENCES—a connection that many people today fail to recognize. Mrs. Jones violated the 2nd and the 5th commandments (since anger is at the root of killing), and she suffered several negative consequences in her experience with the local policeman. In today’s first reading, Moses delivers to the people of Israel the Ten Commandments that he had received from God on Mt. Sinai. Now it’s very important for us to understand what these ten directives are: they are the moral laws that God has built into the very framework of reality. In that sense, they’re a lot like the physical laws of the universe: if you honor them, many good consequences will follow; if, on the other hand, you disobey them, you court disaster. For example, if you decide to walk to the edge of a 1,000 foot cliff, and then take one giant step off the edge, you will not be able at that moment to determine the consequences of what you’ve done! Reality will dictate the consequences to you. You made the choice to do something foolish—you made the decision to violate one of the laws of nature—and now that law (the law of gravity) will take over and you will fall. It’s a simple as that. If you violate the laws of the material universe, you can be sure that there will be negative consequences you’ll be forced to deal with. So why do some people expect things to be entirely different in the moral and spiritual dimensions of reality? Why do they think they can violate God’s moral laws with impunity? Why do they think they can disobey his commandments without suffering any negative consequences in the process? He understood—at 5 years-old! He had done something wrong, and his parents were teaching him a very valuable lesson. What really disturbs and worries me (and this is why I bring it up this morning) is the fact that so many people nowadays don’t seem to take this truth very seriously. They scoff at the idea that there’s any intrinsic connection whatever between commandments and consequences. Perhaps, in some places, that’s because those who have this attitude don’t know the Ten Commandments. They couldn’t distinguish commandment 1 from commandment 8 or 9. But I know that can’t be the case here! We have a brand new Ten Commandments monument sitting right out there on our front lawn! Most of you walk by it every time you come into church. So obviously all of you know them by heart. But the question still remains, even if we know what they are: Do we really think that we can violate them without suffering any negative consequences in the process? Do we really think that we can put other things before God, use his name as a curse word, miss Mass without good reason, disrespect our parents and others in authority, murder someone’s reputation, support evils like abortion and euthanasia, commit sins of impurity (like the kind that have been committed recently at the high school before the school day begins—“Ah yes, Father has heard about these things!”); do we really think that we can take what doesn’t belong to us, and covet and lie, and not have it affect us (and those around us) in a negative way? Are we living in a dreamworld? If we haven’t done so already, it is time for us to wake up to reality! Commandments and consequences—those two “c-words” and what they represent—cannot be separated. Which brings us to another important “c-word”: confession! Confession helps to undo the consequences of violating the commandments. Confession undoes the consequences (especially the ETERNAL CONSEQUENCES) of disobeying the commandments. And that’s why we should go—frequently. Hold On—But Not Too Tightly! Hold on—but not too tightly. This is one of the keys to doing God’s will on this earth. It’s also one of the keys in helping others to do the will of God in their lives. Have you ever heard anything like that before? That’s a perfect illustration of what it means to hold on too tightly. Now if we’re being honest, we will admit that this is a state of mind that can affect any one of us—at least from time to time. But I would say that parents are especially vulnerable to it, simply because of their great love for their children. The thought occurred to me in preparation for this homily: There are probably priests in the world today who never should have become priests! So why were they ordained? By the same token, there are men and women who married the wrong person because of interference from mom and dad or some other member of the family; and there are others whose marriages have broken up because of family meddling. Whenever we try to control or manipulate another human being—even if we do it in the name of love!—we’re holding on to them too tightly. Much too tightly. This is also a tendency we have to battle when someone close to us passes away. As many of us know by experience, “letting go” of loved ones who have died is sometimes extremely difficult. Those of you who were blessed to have your parents for 70 or 80 years; those of you who lost your spouse after 40 or 50 years of marriage—you know exactly what I’m talking about, don’t you? It was a struggle (and perhaps still is a struggle) to let go of them on an emotional level. I knew a woman many years ago who was deeply in love with her husband. They had been married over 40 years, and they were constantly together. He suffered a massive heart attack one day at work, and died shortly thereafter. She was a woman who was in church every Sunday and sometimes even during the week, but in her grief she actually tried to take her own life a few months after her husband passed away. Without a doubt, she was holding on to him much too tightly. She needed to let go of him emotionally—even though it was extremely painful and difficult. I mention this today because it’s exactly what Abraham had to do with respect to his son, Isaac; it’s also what Peter, James and John had to do with respect to Jesus. Something similar happens in the story of the Transfiguration of Jesus, which we heard a few moments ago in that Gospel text from Mark 9. Remember, when this event occurred historically, Peter, James and John had been living with Jesus for 3 years. In the process, they had come to rely on his physical presence with them. And that’s completely understandable! Whenever they wanted help, guidance, or direction, all they had to do was walk up to our Lord and ask him for it. And they did. We all would have done the same thing if we had been in their shoes. Eventually, thank God, they learned the lesson. 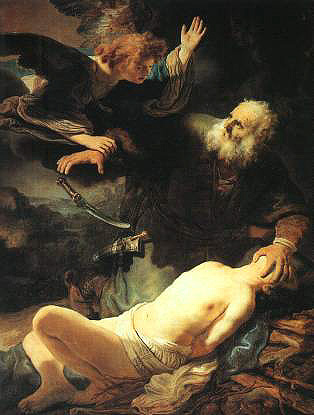 So did Abraham, with respect to Isaac. He held on to his son in love (as any good father would)—but not too tightly. Let’s pray that in our relationships with other human beings on this earth—especially our relatives and close friends—we will do the same.